‘The Body is a Big Place’ has won 2012 Prix Ars Electronica Honorary Mention in the Hybrid Art category. 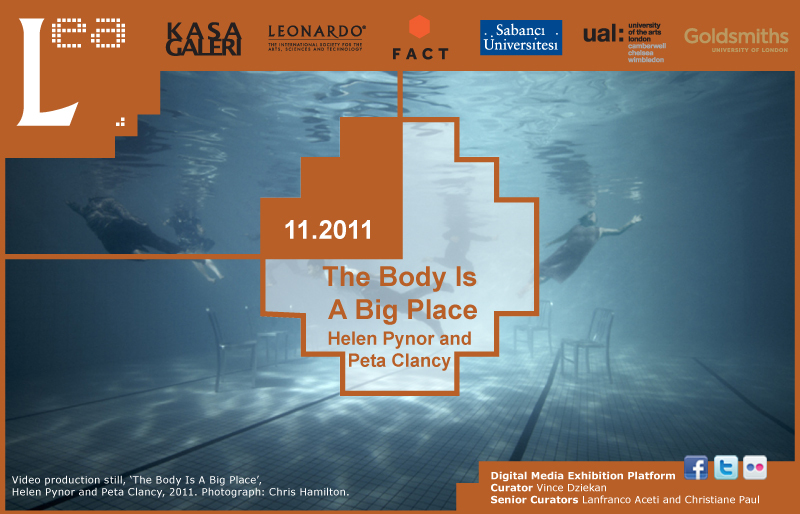 This November we are presenting ‘The Body is a Big Place’ by Helen Pynor and Peta Clancy, with sound by Gail Priest. The online presentation of the project is linked to its exhibition at Performance Space, Sydney from 3 – 26 November 2011 curated by Bec Dean. The work explores the notion of exchange in the context of organ transplantation, including the fluidity between bodily boundaries inherent to the organ transplantation process, the ambiguous boundary between life and death, and the complex and multilayered responses reported by organ transplant recipients. LEA audiences will have the opportunity to gain background insight into the development of the project during a series of research residencies, view video documentation of the associated performances at Performance Space (featuring the reanimation of a pair of fresh pig hearts) and participate in an online forum to discuss issues and ideas raised by the work. ‘The Body is a Big Place’ was orignally commissioned by Performance Space, who are supported by the Visual Arts and Crafts Strategy, an initiative of the Australian, State and Territory Governments. The work is the result of a two-year collaborative research project between artists Peta Clancy and Helen Pynor who for many years have independently explored the intersection of art and medical processes through various forms of photographic, sculptural and installation practices. Their independent and collaborative practices include exhibitions, residencies and commissions in Australia, Asia and Europe. Collaborators in the project include Gail Priest (sound artist) and Professor John Headrick and Dr Jason Peart (Heart Foundation Research Centre, Griffith University, Queensland). The artists acknowledge the support of Australia Council for the Arts, Performance Space, Leonardo Electronic Almanac, Besen Family Foundation, The Editors, Faculty of Art & Design, Monash University, SymbioticA, Sydney College of the Arts, The University of Sydney, The Alfred Hospital, Transplant Australia – Victoria branch.